For leading global brands, getting the name of their brand foremost in consumers’ minds is fundamental to its success. But venture into China – the world’s fastest-growing major economy with growth rates averaging 10% over the past 30 years – and be ready to overcome a series of challenges. Aside from securing a trademark in a country overrun with copycat brands, finding a suitable brand name in China is one of the tougher obstacles an established brand can face. Ahead of his time 2,500 years ago, the great thinker Confucius wrote: “If names be not correct, language is not in accordance with the truth of things.” And today the fact remains that foreign companies should seek professional assistance in researching for the right brand name in Chinese. The Chinese language has thousands of characters often with multiple meanings and pronunciations that vary from region to region. How do companies overcome the linguistic challenges and propel their brand into China? 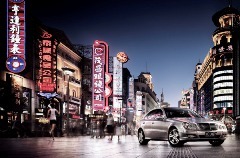 So how have some of the world’s leading brands localised their name in China? Coca-Cola suffered early teething problems. When it first arrived in China in the 1920’s, local shopkeepers would advertise Coca-Cola phonetically as Keke Kenla using Chinese characters that meant, strangely, “tadpoles bite wax” in Chinese. To overcome this, Coca-Cola did some due diligence over in Atlanta, running a competition that was won by an academic from Shanghai who coined what is considered the paradigm of Chinese renderings for any Western brand: Ke Kou Ke Le. It’s a name that has stood the test of time. It’s also a name that ticks both boxes (sound and meaning, route 3) which has been fundamental to the success of the Coca-Cola brand in China. It is now China’s leading soft drink company and one of the top US companies in China. The Chinese name is a close phonetic match to Coca-Cola, while its four Chinese characters translate all the positive connotations the Coca-Cola Company could dream up: ‘Delicious tasty happiness’ or more loosely, “Let your mouth rejoice“. How very Coca-Cola! 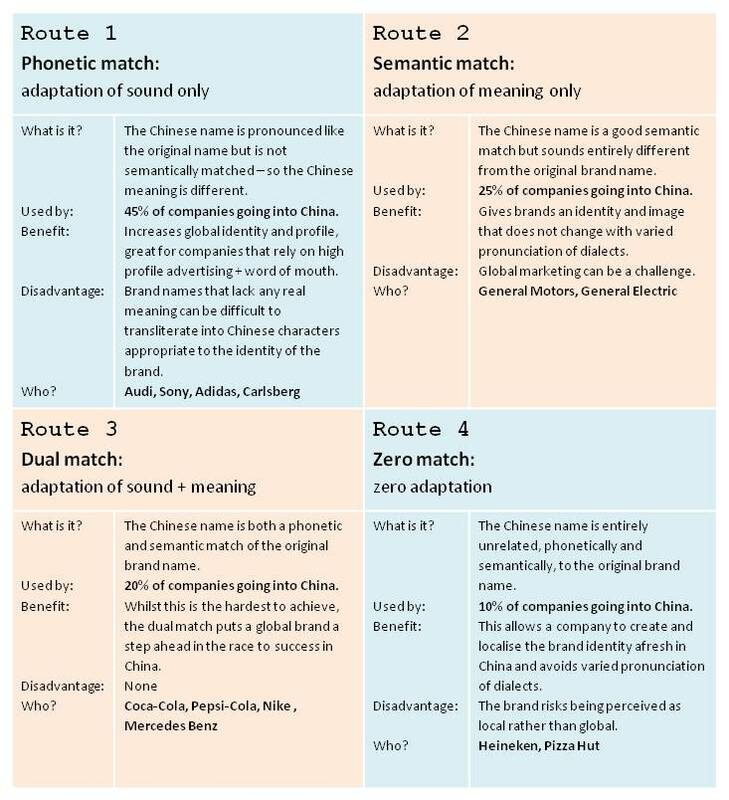 PepsiCo had a smoother journey into China and followed the same naming trend as Coca-Cola, route 3 (dual match). 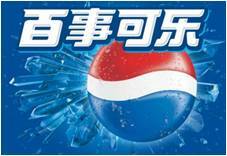 They too chose a well-researched trademark that translates as “Everything laughable” or more loosely “Be happy with everything” The four characters are a close phonetic match to Pepsi-Cola and transliterate as Bai Shi Ke Le. Like Coca-Cola, Mercedes suffered early problems with their Chinese name. The first Chinese translation for Mercedes-Benz was Bensi, a name they quickly changed once they were made aware it means “Rush to your death” in Chinese, conjuring up images of fatal journeys and crash-test dummies. So, back in Stuttgart, the car was soon rebranded as Ben Chi which translates much more appropriately: “Dashing speed”. The result of the rebrand meant they had opted for route 2 – semantic match only. 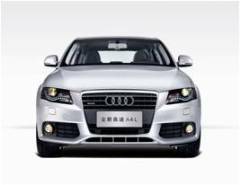 Because the name Audi itself doesn’t have an actual meaning, Ao Di is a phonetic match only (route 1) was chosen for the German brand name in China. The sound of the name alone is what makes Audi instantly recognisable, and it is a brand that relies on its high profile advertising and word of mouth. So where the phonetic translation is near perfect, on the downside, neither of those characters conveys anything meaningful to the Chinese ear. Adidas also took route 1 for a phonetic match to brand its name in China. 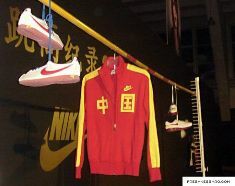 Their entry into China was not without challenge – the brand recently won a 5-year trademark dispute with well established “copycat” Chinese brand called Adivon whose branding is strikingly similar not just in name, but also in logo. Adivon’s Chinese name transliterates as A Di Wang and Adidas’s Chinese name transliterates similarly as A Di Da Si. Nike opted for a clever dual match of sound and meaning (route 3). Nai Ke is a very close phonetic match in name with a wholly appropriate meaning that fits the Nike brand identity and its unmistakable swoosh (no translation required). Click here to see where Nike famously “got their toes burned” in another language, underlining the need for thorough linguistic brand name research in all your markets. 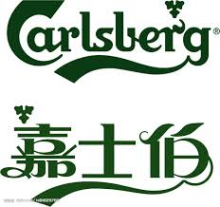 Carlsberg was one of the first international brewers to export beer to China in the mid 1900’s and achieved early fame in the ancient empire for what was regarded as its special “wine” served in Chinese bars. 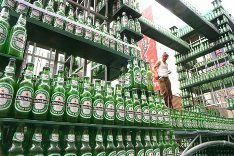 The company officially began its business in Greater China in 1978 and inaugurated the Hong Kong’s Carlsberg Brewery 1981, which became the base for Carlsberg’s expansion into mainland China. The brand opted for route 1 and created a Chinese name that phonetically matches their existing brand. But because the beer’s Chinese name was originally designed to appeal to the Hong Kong market, its Cantonese transliteration Ga See Ba is a closer phonetic match to the brand name than its Mandarin transliteration in Mainland China: Jia Shi Bo. Heineken took the lesser travelled route 4 (zero adaptation) to arrive at a Chinese name that is entirely unrelated, phonetically and semantically, to the original brand name. But in so doing they have succeeded in creating and truly localising the brand in China, while attaching the feel-good qualities of “happiness” and “power” conveyed by the two characters which transliterate as Xi Li. Etymax is a leading London–based translation service provider offering professional brand name research & consultancy to companies wishing to enter new global markets, including China. In addition to suitability of brand name, we advise on suitability of logo design and colour. This research forms an invaluable part of the process in the selection of a brand name that will work well across the global arena.